Intensive therapy using a robot has helped patients improve arm movement years after having a stroke, according to a US study. Researchers from Brown University, in Rhode Island, used the machine to provide three months of training. The New England Journal of Medicine reported that many patients had improved quality of life. UK stroke experts said the advance was "exciting" but added that robots were still at early stages of development. Strokes can leave people with long-lasting disability, which can include limited movement and weakness in upper limbs. Intensive therapy, starting as soon as possible after the stroke, is the recommended way to maximise the amount of movement recovered. However, providing the physiotherapist needed for at least a hour per patient per day places large demands on the NHS. One possible solution is to use machines which help patients reproduce the necessary movements. 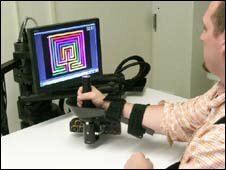 The Brown University trial tested a device called the MIT-Manus, specifically designed to help exercise the upper limbs. The patient sits at a table with their upper arm in the device, and is then instructed to perform tasks with the arm. The robot senses their movement and helps if required. The researchers described the robots as "power-steering" for the arms. The study involved 127 patients who, on average, had suffered a stroke five years earlier. They were split into three groups - one received "robot" therapy over a three month period, the next received the equivalent intensive therapy - carried out by a physiotherapist - while the third received "normal" healthcare, with no intensive treatment. Both the "robot" group and the other intensive group had significantly improved upper-arm function - measured by how much better they could carry out everyday tasks such as using a knife and fork, opening jars or tying shoelaces. The researchers involved have said they are delighted with the improvements - particularly given the years between stroke and treatment in the patients used in the research. Dr Albert Lo, who led the study said: "We've shown that with the right therapy [patients] can see improvements in movement, everyday function and quality of life - this is giving stroke survivors new hope." Dr Diane Playford, from the Institute of Neurology in London, is part of a team trying to develop similar robotic devices in the UK. She is hopeful that, at some point, a machine compact enough to be used in the patient's home will be developed. "The fact that these patients have improved function is exciting. "We would normally think that patients who began therapy at an earlier stage could do even better." However, she said that robots were still at an "early development" stage, and some years from full-scale use in the NHS.